Fibromyalgia Awareness Day is this Friday, May 12, and part of spreading awareness is educating people about the condition. Now I know anyone can search Google or WebMD, but a list of symptoms doesn’t give the whole picture. I feel that fibromyalgia is better explained by those who live with it. With that said, as a fibro fighter, I’ll do my best to provide information and descriptions that will help people better understand this illness. Fibromyalgia is a chronic illness that causes widespread pain. It is diagnosed in women and men, and contrary to what many believe, people of any age can have fibro. In addition to pain, the main symptoms of fibromyalgia are fatigue, cognitive difficulties (referred to as “fibro fog”), sensitivity to light and sound, irritable bowel syndrome, sleep disturbances, and migraines. There is no cure and the cause is not yet known. Fibromyalgia pain is difficult to explain. The pain is mainly in our muscles and joints, but it can literally radiate from the top of our heads to the tips of our toes. (Oh, how I wish I were exaggerating). We feel throbbing pain, shooting pain, and sharp pain; severe pain, moderate pain, and dull pain. Let’s say you fell down a flight of stairs. You didn’t break any bones, but you have a couple sprains are severely bruised all over your body. You can’t bend down and can barely lift anything. It hurts so much to walk that you need a cane. You stay in bed but you can’t get comfortable because the pain is literally everywhere. Imagine if those sprains and bruises didn’t heal and you had to live with that pain and discomfort every day. Many of us with fibromyalgia feel like that. We use phrases such as “I feel like I got hit by a truck” or “I feel like I got beat up” because the pain is often intense and all over our body. When people hear “fatigue”, they think “tired”, which is not completely accurate. To feel fatigued, a person doesn’t need to have a busy day or a sleepless night. Performing simple tasks like brushing your teeth or getting dressed are difficult and draining. And taking a shower? That’s like running a damn marathon. Some people with fibro say fatigue is similar to how run-down you feel when you have the flu. Think about the last time you were real sick with a high fever. It was tough to get out of bed and move around, right? Now think about having that feeling nearly every day, on top of the falling-down-a-flight-of-stairs pain. There are many different treatment methods that are used for fibromyalgia. Prescription medication, supplements, medical marijuana, acupuncture, physical therapy, and so on. What I’m about to tell you is probably the most important piece of information to remember: Everyone’s body is different. What works for one person may not help someone else. There are medications that people can’t take due to bad side effects or because it interacts with something else they’re taking. And like other illnesses, there are different severities of fibromyalgia. So please keep in mind, the treatment that worked for your brother’s neighbor’s second cousin won’t work for everyone. Support from our family and friends is incredibly important to us. I understand that it can be frustrating and/or disappointing when we can’t make it to a social function, especially if we have to cancel last minute. Please know that we don’t want to cancel. We absolutely hate having to miss out on important events. The guilt we feel is often overwhelming. It’s our illness that’s unreliable. The best thing you can do as our loved ones is to believe us and just be there for us. We need your love and support to keep us going, and for those of you who have already been doing that, we appreciate it more than words can say. What I’d like everyone to know is we do the best we can. We have good days and bad days, and unfortunately we have no way of knowing what tomorrow will be. We have to listen to our bodies and know our limits. If we do too much, we’ll be in bed for days. Most of us were healthy, active, and social before we were diagnosed with fibromyalgia. 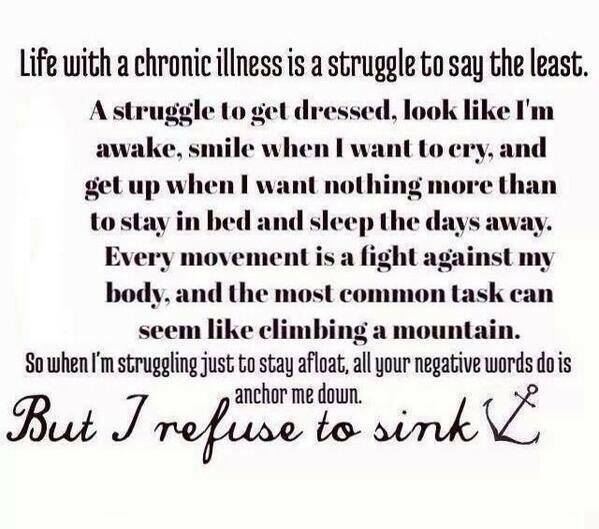 Having a chronic illness like this is life-changing. But we keep going because we are strong. We will continue to fight fibromyalgia every day and hope that down the road, there will be better treatments available. If you didn’t know anything about fibromyalgia, I hope you learned something! Please support your loved ones with fibro and spread awareness! Those of us with fibromyalgia are constantly fighting. We fight our pain and fatigue every day to be able to function. We fight for proper treatment from doctors and health care professionals. We fight through depression and anxiety. We fight for support from our family and friends. We fight through the trial and error process of various medications and treatment methods. It’s 2017 and we need positive changes in the world of fibromyalgia! I want to fight for ALL doctors to be better educated and informed on the latest treatment methods, techniques, and medication. I want to fight for accurate diagnostic criteria. I want to fight for more research. I want to fight for patient-centered care. I want to fight for us to be treated with more respect from everyone – doctors, nurses, family, friends, and co-workers. During the month of May, I will be doing my best to reach as many people as I can to help them understand what this fight is about. This is more than spreading awareness. This is a fight to improve the quality of our lives. I think it’s worth fighting for. Will you join me in the Fight for Fibro? Over a week ago I created a new Facebook group called “Fibro Fighters Under 40”. I’ve been wanting to do it for quite some time, and I’m glad I finally did. I felt like those of us that are younger with Fibromyalgia can relate to each other better and need as much support as possible. Our age group is expected to be healthy, active, working, socializing, etc. Fibro obviously limits us from being “normal” young adults. I’m 29 (the big 3-0 in March) and I’ve found out from my own experience that most people can’t wrap their head around the fact that I’m “so young” and in pain. Nothing against older people with Fibromyalgia, of course! Anyway, there are already 50 members in my group, and I think it is already a success. The members are happy to have somewhere to vent, share, and relate to people close in age who are having similar experiences. So as I said in a earlier post, we closed on our condo on Friday after a very long, drawn out process to get our mortgage loan. We couldn’t be happier that all that bs is over. We began to move boxes in on Friday night with the help of my in-laws. It was so nice of them and saved us some trips. We’ve been slowly moving stuff in but it’s been hard with our work schedules not lining up. We stayed at the condo late last night unpacking and I woke up today feeling awful. I should’ve rested all day and instead went to a couple stores to get some things we need. I have a 10-hour work day tomorrow, then I’m off Tuesday with my husband for our official move-in day. We’re getting our bed, mattress, couch, and dining set delivered so it’ll be our first night there. I work Wednesday and Thursday and then have Friday-Sunday off. I am so tired I can’t see straight, and the pain is so bad I don’t have words to describe it. I’m throbbing everywhere. Tomorrow is going to be rough, and even though I’m off Tuesday, it’s not exactly a day of relaxation. I’ve definitely done way more than I should have in this moving process. Carrying boxes that were too heavy, bending over too much, all the unpacking/organizing… I couldn’t let my husband do everything. He’s done so much already and I want to feel like I helped. Now I’m paying for it of course. I thought I would’ve had more time to rest this weekend. Can’t wait until Friday when I can finally be in my home so I can rest and not worry about anything. Gonna be a loooong week. If you love cooking, entertaining your friends, and supporting a worthy cause, then this event is worth your time and energy. NFA’s Feast, Friendship and HOPE event is to commemorate 2015 National Fibromyalgia Awareness Day (May 12th) and promote education and understanding of this life-altering condition. Please invite your friends to your home for a fundraising dinner, father at your favorite restaurant, or even have a cocktail party. Whatever you choose, your efforts will help to make fibromyalgia visible and more research possible. Simply invite your friends, colleagues and family to your gathering and ask them to make a contribution – either through the NFA’s website or right there at your party. Make sure you take lots of pictures or video and share your experience with the FM community on the NFA’s social media pages. You can host your own even between now and May 12th, 2015. Ok. I’m glad there’s an awareness day for us fibro fighters. I really am. But inviting friends over and asking them to make a donation? That’s just downright awkward… at least to me. I could never do that. There are so many of us who not only struggle with pain every day, but with our loved ones and colleagues not understanding our illness. I know awareness days for other illnesses involve walking/running, which the majority of us can’t do, so the NFA was trying to be creative. I wish I had a better idea, and I’m not trying to put down the NFA or insult anyone, but there has to be a better way. We need ads on television aside from Lyrica commercials that are just awful. (I take Lyrica, I just hate the way it’s advertised). We need national and international attention. We need TONS of research. And we need understanding. If I did this “Feast, Friendship and HOPE” thing, I’d not only feel awkward, but it would seem like I want my friends/family to feel sorry for me, which is of course not what I want at all. I’m sure this could be done for some people who have a strong support system, but for myself and many others, we can’t participate. Does anyone have thoughts or opinions about this? Please feel free to comment, I’d love to hear what others think. I’ve been wanting to post something all week but I’ve been exhausted and in pain. Work was stressful this week. It’s not enough that my job is physically tough for me. It’s also mentally draining. Dealing with the public isn’t easy, to put it simply. Most of the people that come in are rude, demanding, and impatient. There is no reason for anyone to scream at me (especially when I didn’t do anything wrong). That type of behavior is disgusting. It was like that all week. It seemed like 9/10 interactions with customers were negative. First of all, I don’t deserve to be disrespected. I work hard and go out of my way for people all the time. Second of all, I get paid a very low hourly wage so honestly, I don’t get paid enough for this s**t.
My pain level for the past couple weeks has been through the roof. I know part of it is because I worked three 40-hour weeks in a row. My bank account is smiling, but my body is crying. Also, there was Easter, a concert, and dealing with details concerning the closing on my condo. We are closing on Friday, the 24th, as far as we know. This process has been incredibly stressful from start to finish. Nothing went smoothly. Even the simple things were extra work. It’s been a nightmare, but it’s almost over. And then comes the fun part: actually moving. HA. Thank God for my husband, who unfortunately will be doing most of the labor. I will do what I can, but I really can’t lift or carry much of anything. Our condo is on the second floor too, so it’s going to be a real challenge for me. I was able to take one day off for when the furniture gets delivered. That’s it. That’ll be our first night in our new home, which includes transitioning my cat into a new environment. Then the next day we both have to get up early and go to work. And leave my poor cat alone in a new place. I tried to take that following day off but there’s no one to cover my shift. I’m happy I have today and tomorrow off, but I have a lot to do. I’m in the process of doing laundry right now, but I have to go through more clothes and make donation bags for things I don’t want/don’t fit anymore. Then the worst part will be sifting through all my paperwork. My parents have a shredder and I’m sure I’ll be borrowing that. I have to organize everything into folders and throw out or shred what I don’t need. With all that said, all I want to do is rest. I’m beyond exhausted and I’m in severe pain. I hurt everywhere. I want to cry. I haven’t really told anyone how bad the pain has been because I don’t know how to describe it. Not to mention, no one understands. My husband tries, but as anyone with fibro knows, unless you have it, it’s extremely hard to describe. The “I feel like I got hit by a truck” description only goes so far. There’s so much going on right now and I can’t take anymore, mentally or physically.